The Bookshelf Diaries takes a peek into the reading life of writers, readers and book lovers. This week, playwright Cathy Petocz tells us yes, she does have a favourite book of all time. I’ve just finished Ninety 9 by Sydney writer Vanessa Berry, which I took on a trip to help me feel less nervous. She’s a very nostalgic writer and I always feel cosy reading her books and zines. It’s time for a treat and so I’ve just started Trouble is My Business, a collection of short stories by Raymond Chandler. I also have the latest issue of Apartamento to meander through. I bought Ninety 9 from Vanessa Berry herself, feeling shy. Trouble is My Business is part of my Folio collection – beautiful books with their own boxes to keep them safe from dust. There are three second-hand bookshops in Canberra that often have them: Book Lore, Canty’s Bookshop, and Beyond Q.
I’ve just returned from Playwriting Australia’s National Script Workshop in Sydney and had so many interesting conversations with playwrights there. I want to continue being in this space, so I thought reading Australian plays would be good for me. I loved Leanne Shapton’s Swimming Studies. I love the way she talks about her relationship with time and the portraits of her bathing suits. In Summer I read volumes of short stories in cafes with an iced coffee. In Autumn I read magazines lying on my bed. In Winter, plays at the National Library. In Spring I like reading Franny and Zooey with a chicken sandwich and a glass of milk on the back step of my house. I like to eat the food that is in the book I’m reading. I also want to throw a dinner party where my friends and I read Caryl Churchill’s Top Girls. The first act is a dinner party with women from different times and places, a demon-killer from a painting, a 13th century Japanese courtesan, Pope Joan, et al, and the second act is reality, which we can read over cognac. Siri Hustvedt’s What I Loved. When I wasn’t reading, I could feel where the book was in the room because I wanted to be reading it so much. Recently I’ve been reading the archived playwright interviews on The Paris Review website. But I love going to my best friend’s house and looking into her art books: Félix González-Torres, Martin Creed, Cézanne. There is more in a silent image for me than in words telling, telling. 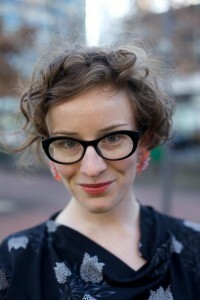 Cathy Petocz is an emerging Canberra-based theatre practitioner: a playwright, performer, animateur, and pop musician. She makes miniature installation theatre works, pop-up girl bands, and is currently finishing her first major play, Where I End & You Begin, which will be staged at The Street Theatre in Canberra, October 2014. This entry was posted in Arts, Books, Theatre and tagged books, playwrighting, the bookshelf diaries, theatre. Bookmark the permalink.